I've made quite a bit of progress on the Hillman project. Most of the hard work is out of the way. Once it was running we could drive it around and work out the kinks. 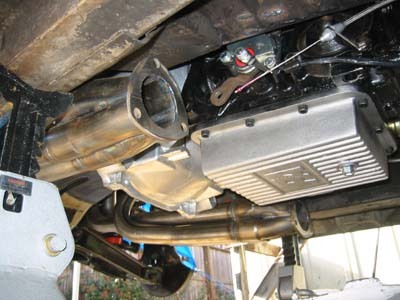 I took it to A1 Muffler in Morgan Hill, CA to install the exhaust. I used 2 1/4" stainless steel exhaust pipe and SpinTech mufflers. The mufflers are only 2 1/4" thick and sound great. A trip to the alignment shop revealed a bent spindle so I replaced that and will have to take it back for alignment later. After driving it for 2 weeks we tore it down for a trip to the body shop. I never got a chance to really step on it as it really needs a tune up and would back fire if I gave it too much gas. The 650 Speed Demon needs some adjusting. I sent out all the trim for plating and polishing. I got it back and it looks really good. I also sent out the headers to Jet Hot for coating. Original Husky wheels are getting widened to 5". I decided to get rid of the square Husky inner fender supports and replace them with lower profile Tiger braces. This was necessary to make room for the Tiger steering rack. Shortly after this picture was taken, we removed the squared piece on the brace that was used to connect the strut to the firewall. We didn't think this was necessary as the car gained strength from the roof. Here you can see the final position of the steering column. I opted to use modern Borgeson U-joints as they are able to handle greater angles than a stock Tiger unit. In addition, the top U-joint has a vibration dampener. The whole U-joint assembly was shorter than the Tiger one so I was able to use a stock length Tiger steering column. You can also see how the motor hanger bolts right up where the Husky steering use to go. Here Paul Reisentz of Reisentz Restorations and I are firing up the motor for the first time. I had Peter Economoff of Peterbuilt Radiators in Santa Barbara, CA make me a 3 row radiator. I am going to see if I can get by without an electric fan. So far, it hasn't gotten above 160 degrees. Radiator hoses proved to be a challenge so I just spliced a couple together. I could have done Cool Flex but I did not like the look...Plus, I put a Gano Filter in so I needed a splice anyway. 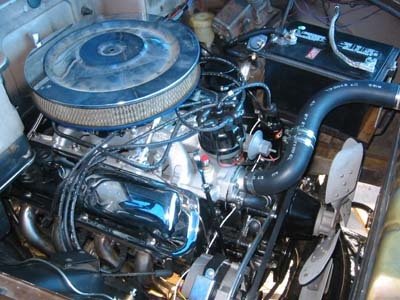 Here is another shot of the engine. I still need to fabricate a spacer to bring the fan closer to the radiator. We had to fabricate both upper and lower alternator brackets. I don't really like the positioning as it's a little too close to the frame and there isn't enough room to pull it away. It's also too close to the lower radiator hose. I'll probably mount the alternator much higher which will allow for side to side adjustment. A stock Ford Mustang shifter was used and has been wired to light up. Here it is all stripped down getting ready to go in for paint. Just for fun I decided to shine up the front fender and it actually looked pretty good. I'm convinced these are the old PG&E colors of tan and brown. The Tiger crossmember was removed for painting and an Alpine unit was put in its place just to make it roll. Tim at Frank's Frame & Body Shop in Valley Springs, CA is drilling a hole for the antenna. I found a cool NOS Motorola retractable antenna on eBay. It retracts and locks in place. To open it you need a little key which pops it up a couple inches. I had them fill severals holes in the engine compartment including the fresh air vents in the firewall and radiator support. They also filled in the 2 heater holes. We mounted a Vintage Air heater/defroster on the passenger side under the dash. These are the stock colors of Antelope and Foam Gray. The gray turned out a little too gray. Should have been more of a tan or off white color.